A Pediatric Endocrinology Unit, Division of Pediatrics. School of Medicine, Pontificia Universidad Católica de Chile, Chile. B Pediatric Endocrinology Unit, Division of Pediatrics, Dr. Sótero Del Río Hospital, Chile. Cushing’s syndrome (CS) is an endocrine disease by to glucocorticoids excess, depen dent or independent of adrenocorticotropic hormone (ACTH). The main cause is iatrogenic due to excessive use of glucocorticoids. To show the association between prolonged use of topical corticosteroids and the development of CS. An infant treated with topical cor ticosteroids due to seborrheic dermatitis. Due to long-term unsupervised use, he develops Cushing’s syndrome characterized by obesity and compromised growth rate. Topical use of corticosteroids was discontinued and physiological replacement therapy was initiated with descending doses, achieving clinical improvement. Topical corticosteroids are widely used in clinical practice for management of dermatological pathologies. These are available in various presentations with va riable efficiency. The main determining factors in its action are the characteristics of the skin, the active principle of the drug, the potency and application technique, so that the adverse effects are observed more frequently in the use due to diaper dermatitis. The main adverse effect of long-term use is Cushing’s syndrome which can be prevented through supervised use and progressive decrease. The rational and careful use of topical corticosteroids is essential to take advantage of the beneficial effects and avoid adverse effects. Cushing’s syndrome (CS) is a systemic endocrine disorder resulting from abnormally high plasma corti sol levels1. The incidence of CS is not well defined, especially in the pediatric population. Overall, the most common cause is iatrogenic, secondary to excessive exogenous administration of glucocorticoids1. Endogenous CS may occur dependent or independent of the increased secretion of the hormone ACTH. Within endogenous CS, Cushing’s disease (corticotrope ade noma) represents 60-70% of cases in patients over 5 years of age, considering, in the differential diagnosis, ectopic production of ACTH and exceptionally, ectopic production of ACTH-releasing hormone (CRH). In those cases, ACTH - independent, chronic hypercorticism inhibits the secretion of CRH and ACTH2, through negative feedback. In this group, it is sugges ted to evaluate the presence of unilateral adrenal injury (adenoma/carcinoma) or bilateral (macro or micronodular adrenal hyperplasia), especially in patients under 5 years of age11. The use of topical glucocorticoids is an important tool in dermatological therapy, due to their powerful anti-inflammatory and antiproliferative effect. However, prolonged exposure to potent topical corticosteroids may cause side effects such as skin manifestations (corticoderma), compromised growth velocity and suppression of the hypothalamus-pituitary-adrenal (HHA) axis3, especially in the absence of appropriate medical supervision. The aim of this report is to highlight the associa tion between long-term use of topical corticosteroids and development of adverse effects, specially Cushing’s syndrome and growth rate failure. 1% cream associated with clotrimazole. Subsequently, the patient’s condition persisted, so the indication was changed to betamethasone dipropionate cream 0.05%. Due to the positive initial clinical response to the treatment, the mother maintained the use of cream in each diapering for 10 months of continuous treatment, without further re-evaluation by the health team. The patient did not present any other relevant personal or family history. At the time of the physical examination, the patient had a cushingoid facies with small eyes, mouth in carp, vultuous cheeks, bitemporal fat, hypertrichosis and chin (Figure 1). Within his anthropometric evaluation, he highlighted a decreased height/age ratio with Z score -4.26 and an increased weight/height ratio with Z score +2.93 (Figure 2). Likewise, an increase in blood pres sure (BP 108/64 mmHg) was investigated, considering the 95th percentile (BP 102/54 mmHg) according to gender, age, and height12. The rest of the examination was not significantly altered, except for the persistence of a slight perineal erythema. Figure 1 First outpatient endocrine clinic at the age of 1y 2mo. Figure 2 Growth chart with initial decreasing height velocity. A iatrogenic Cushing’s syndrome associated with obesity was suspected, with secondary hypertension (BP) stage 1 and low height with poor growth rate. In the initial management, it was indicated to stop immediately the use of topical corticosteroids and to start treatment through oral route in high physiological dose range (13.5 mg/m2/day), educating regarding dose adjustment in case of acute pathology. Male patient, 1 year 2 months of age, evaluated for decreased in height since 6 months of age. First child of non-blood related parents, pregnancy without com plications. Forthy-week full-term newborn, adequate for gestational age (AEG NTRI) with a birth weight of 3195 g and length of 49 cm, without pathology in the neonatal period. No relevant morbid antecedents were described. During the first evaluation in the Pediatric Endo crinology clinic, a characteristic cushingoid phenotype was observed, therefore it was specifically asked about the use of corticosteroids. During the third month of life, the patient was evaluated at CESFAM due to dermatitis in the scalp and perineal area, without having a history of atopic basal dermatitis. The indica ted treatment was topical with hydrocortisone acetate and delayed bone age (BA) (6 months BA for 1 year 3 months in chronological age). The patient progressed positively with gradual de crease in signs of Cushing’s (Figure 3) associated with improvement in growth rate and progressive weight loss. After completing 6 months of oral hydrocortisone replacement therapy (13 mg/m2/day), it was progres sively lowered to 10 mg/m2/day and a morning basal cortisol measurement was requested to evaluate possi ble suspension. The examination showed a basal cortisol of 7.3 ug/dL, so a physiological dose (8 mg/m2/ day orally) was maintained and a micro-dose ACTH test (1 ug) was requested. This test was performed after one year of treatment with hydrocortisone, resulting in a pre ACTH cortisol of 6.32 ug/dL and a post ACTH cortisol of 24.2 ug/dL (normal reference value > 18 ug/ dL), therefore the drug was diCSontinued. Figure 3 Follow-up at 3, 9 and 12 months of oral cortisol treatment. Topical corticosteroids are widely used in the pe diatric population for the management of various dermatological conditions1. These are available in different presentations, concentrations and potency4, classified in groups I to VII, according to the latter characteristic5-7 (Table 1)10. Clobetasolpropionate is the most powerful preparation associated with syste mic side effects, but any corticosteroid used in suffi cient quantity, duration and extension can produce them5. Four factors are deCSribed as determinants in the application of topical corticosteroids associated with an increased risk of developing side effects: skin (area, extent and severity of the barrier), active ingredient of the drug (potency), vehicle (form of presentation) and application technique (dose, frequency and duration of treatment)4,9. In children, it is recommended to use the least po tent topical corticosteroids (Table 1) and to evaluate absorption according to the presentation of the medication, considering greater absorption with greater crasticity (ointment > cream > gel > lotion > aerosol > powder). Children are especially suCSeptible to developing systemic adverse skin reactions due to their higher ratio of skin surface to weight3,5. Skin thinness is associated with a higher level of absorption, especia lly in areas such as mucous membranes, CSrotum, and eyelids. On the other hand, the hydration of the skin (after bathing), friction and occlusion favor the penetration of the medicine. In this context, the main risk factors associated with increased absorption are appli cation to inflamed skin with loss of barrier function and anatomical region treated by thinness in certain targeted regions (mucous membrane and CSrotum)4. A pathology characterized by the presence of both factors is allergic diaper contact dermatitis. This con dition should be distinguished from irritative diaper dermatitis (90% of cases), as management changes significantly. While allergic dermatitis can be treated with topical corticosteroids and occasionally calcineurin inhibitors after being evaluated by a dermatology specialist, irritative dermatitis prioritizes the re-esta blishment of the skin barrier through general measures such as frequent diaper changes and management of any intercurrent fungal infection. Usually, the initial indication of topical corticos teroids is justified by the benefits in the management of dermatological pathology9, in addition, their appropriate use produces slight adverse effects, considering the choice of the least potent corticoid to control the disease in an adequate way5. Because of this, the health team must teach the patient about the correct use of these medications and educate about possible adverse effects5. Adverse reactions to the long-term use of topical corticosteroids include suppression of the HHA axis and Cushing’s syndrome with growth rate compro mise. Suppression of the H-H-A axis by exogenous steroids is the most common cause of adrenal insuffi ciency (8) and can be observed in up to 48% of pa tients treated with potent steroids. The risk of sup pression increases according to the dose administered and the duration of treatment. Likewise, the period of recovery of the adrenal axis functionality is propor tional to the time and intensity of the suppression and may take weeks or months to reactivate. Regarding CS, the characteristic clinical phenotype is frequently deCSribed, but the deterioration of the growth cur ve is not (4). In case of clinical suspicion of CS, the presence of hypercorticism must be confirmed in a biochemical/hormonal form. After confirmation, it is suggested to complete the study to establish the cause by plasma ACTH measurement and imaging evalua tion, as needed. In the context of this case and the increased fre quency of the iatrogenic cause, a fundamental aspect of treatment is the suspension of topical corticosteroid and supplementation with hydrocortisone in physiological doses (9-12 mg/m2/day) in its enteral or paren teral form. Likewise, the decrease in supplementation should be progressive and gradual to allow the reacti vation of the axis and the correct functionality of the adrenal gland. During follow-up, an important aspect to consider is the education and prevention of acute intercurrent pathology, due to the high risk of trigge ring an adrenal crisis if the dose is not increased tem porarily for stress response. Finally, it is recommended to evaluate adequa te adrenal function by measuring basal cortisol and/ or ACTH test, the latter being considered as the gold standard4,5. Our patient showed classic clinical signs of excess corticosteroids. 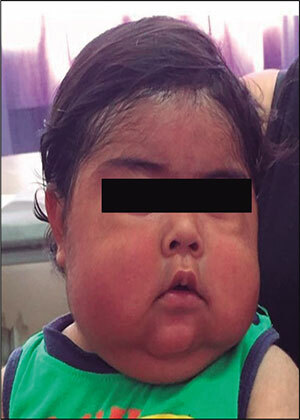 During infancy, the anthropome tric pattern characterized by weight gain associated with slower growth rates should lead to suspicion of Cushing’s syndrome within the differential diagnosis. The rational and careful use of topical corticosteroids has multiple therapeutic benefits and may prevent ma jor adverse reactions. Rights to privacy and informed consent: The authors have obtained the informed consent of the patients and/or subjects referred to in the article. This do cument is in the possession of the correspondence author. **Correspondence: Javiera Hansen S. javiera.hansen.s@gmail.com.